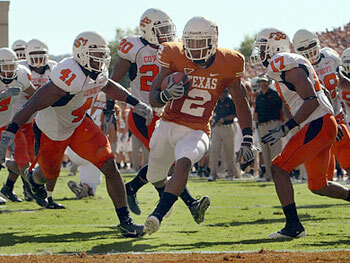 Wide receiver [tag]Brandon Collins[/tag] is done as a Texas Longhorn. 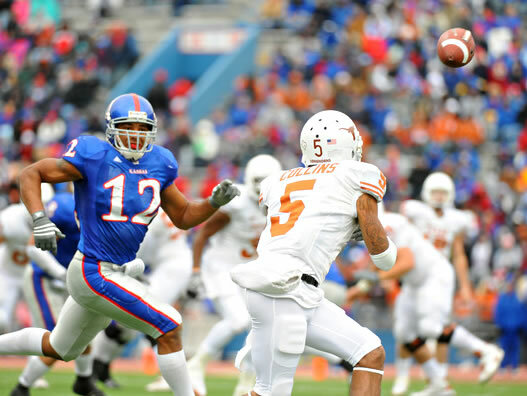 After missing the 2009 season due to academic troubles, Collins was arrested on felony assault charges Saturday and then immediately dismissed from the team Sunday when Mack Brown learned of the news. Collins’ career at Texas was already on thin ice due to various academic and character problems. Collins was arrested after an alleged aggravated assault at a Pflugerville Mcdonald’s. Dispatchers got a call at 2:36 p.m. Saturday from a man who said he had been robbed at gunpoint in the McDonald’s parking lot. He said he had been waiting there to meet an old friend, Marcus Caruth, 19. The victim told police a black male ran up to him with a gun and demanded money from him. He identified the man as Caruth. The victim says Caruth ran back to a silver Chrysler Sebring convertible with a black top and Texas license plates and it drove off. Officers later spotted a vehicle matching the victim’s description, stopped the car in the 1800 block of W. Pecan St. and detained the occupants. The back right passenger was identified as Caruth, the front passenger as Ashton Collins, 25, and the driver as Brandon Collins, 20. Officers found a loaded pistol under the front right seat and a small amount of marijuana and a substance believed to be hashish in the car. Caruth and Brandon Collins told police they had arranged the meeting with the victim to buy marijuana. Although the victim stated that Caruth was the man who had attacked him and with a gun, both Caruth and Brandon Collins said it was Collins who approached the victim and he, at no time, had a gun. They both said Ashton Collins was the only person who had a gun. Expected to be the number two guy behind [tag]Jordan Shipley[/tag] this year, I was hoping Collins could get his head on straight and be a reliable veteran option for new QB [tag]Garrett Gilbert[/tag] in 2010. Fortunately the Horns have seen flashes from returning wide receivers [tag]Malcolm Williams[/tag], [tag]Marquise Goodwin[/tag], and [tag]James Kirkendoll[/tag]. The fact that the Texas coaches are bringing six high school commits at the position, including the state’s number one wideout Darius White who committed yesterday. Collins may no longer be a Longhorn, but let’s hope the young man realizes his potential and can get his life together before it’s too late. Does Texas need to run the ball to win it all? Do the Longhorns need Vondrell McGee and the rest of the running backs to step up? Not that I’m breaking any news when I say this, but it bears repeating: this could be a special year for our Longhorns. A majority of our starters return, our coaching staff is arguably the strongest in Mack’s tenure and they have an understandably large chip on their shoulders after getting rooked out of the National Championship last year to a team they beat. Coming out of the spring game, here is #1 concern I’ve heard/read from Horn fans: what about the running game? Who’s the go-to running back? WHAT ABOUT THE RUN GAME??!?!??! To that I say… play it cool Superman, play it cool. Look I know that a run game is important, but is it vital? Ehhhh… not sure. The run game last year was subpar (by Texas standards) and it would be nice to be able to just run, run, run on anyone we damn well please because, in all honesty, nothing emasculates your opponent more than just cramming the ball down their collective throat. I get it, what I don’t get is the panic-stricken nature that us fans are treating this. Conventional wisdom says you need to be able to run the ball to win championships; however, conventional wisdom also said that a team couldn’t win a National Title either running the spread (until we did) or if your leading rusher was a quarterback (again, until we did). The point is, teams that obey “conventional wisdom” rarely make history. Looking at it, what makes our offense more imposing; forcing one of our unproven tight ends out on the field and lining up out of the I, or getting [tag]Jordan Shipley[/tag], [tag]Malcolm Williams[/tag], [tag]Brandon Collins[/tag], and [tag]James Kirkendoll[/tag] out on the field at the same time? In my view, that’s the difference between asking someone which they would rather juggle, water balloons or grenades. A mistake with one leaves you mildly inconvenienced, while the other leaves you totally destroyed. Let’s be honest, it’s not like any of the guys in the backfield are [tag]Jamaal Charles[/tag] quality; they each have their strengths and weaknesses, and none of them are a complete back. On the other hand, our receiving core is the deepest and most talented group of the [tag]Mack Brown[/tag] era. Jordan Shipley is nails, Brandon Collins is smooth route runner and great after the catch, Kirkendoll seems to be scratching the surface and the ceiling for Malcolm Williams seems to be Limas Sweed at worst! Not trying to be dramatic, but this set of receivers is a gift, we should use them as much as we can. Most importantly, we have (by the numbers) the most accurate quarterback in the history of college football back for his senior year. Is our offense better served forcing the ball to our stable of good not nearly great running backs, or letting the most precise passer we’ve ever had in burnt orange throw darts to our studs out wide?? Our run game last year worked this way: run a little in the first half to keep the defense honest, but most of the damage was done with quick passes to the wideouts, which not only gained us yards but also served to sap the strength out of the opposing defenses legs. In the second half, the creases became bigger and the holes came more frequently (see the [tag]Oklahoma[/tag] game for a perfect illustration).